Here are 9 fun and creative pressed flower ideas you can make with blooms from your backyard or a bouquet from a special event. I’ve been pressing flowers forever and if you have been following me for a while then you may remember a few of these projects. One of the best times to gather blooms to press is at the end of summer before the annuals from the container gardens are cleaned up for fall and winter. I find the natural beauty of pressed flowers and leaves makes any project look all that more awesome. So today I hope to inspire you by sharing a nice roundup of my pressed flower projects. First, you need to start with pressed flowers. You can buy some online which is great if you are short on time. However, it’s even better when you press your own flowers that you have grown or some from a bouquet from a special event. An old phone book with some extra weight works well for pressing flowers. However, if you want to take it a step further you can make your own flower press like the one shown above with a few simple materials. 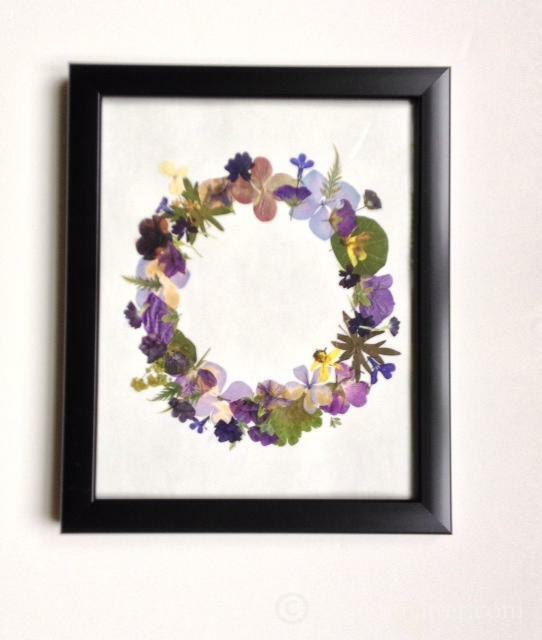 One of the first posts I wrote about using pressed flowers was about making gifts for others, like this beautiful framed pressed flower wreath. How wonderful would this be with some of your flowers from a wedding or a first date? This fun project is something I made with my garden club years ago. You can use an existing pillar candle or something from the dollar store. So easy and they last for years. Purely ornamental as you cannot burn them. Mason jars have a great appeal and I really like the way the flowers peek through the wax. These are meant to be burned and depending on the type of wax you use should last a long time. Making your own paper from recycled waste paper is easier than you may think. Add in a few pressed or dried flowers for an added touch. Simple little keepsakes make great gifts, like these glass coasters that really show off the beauty of the plant material. This resin tray can be used to serve tea or breakfast in bed. A fun medium to work with. Even though some of the plant colors changed, it still turned out beautiful. People pay a lot of money for botanical prints but you easily can make these for next to nothing. 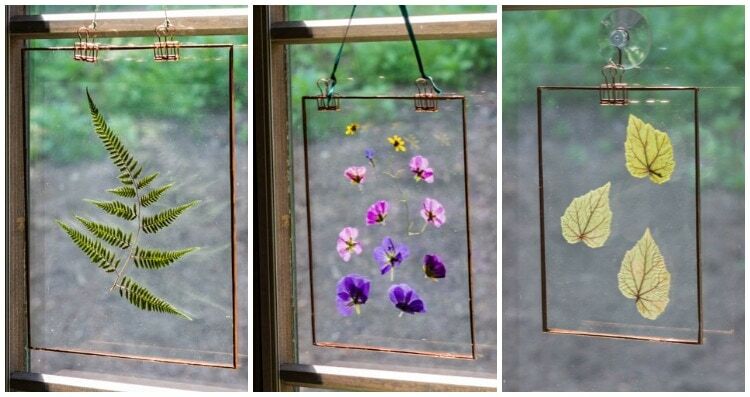 Hang your beautiful specimens in the window with these easy to make suncatchers. An affordable yet stunning gift. Last but not least are these pressed flower jewelry dishes. Here you are using the flowers to press into the polymer clay, but I thought they would be fun to share with this group. I hope this fun roundup inspires you to gather a bunch of flowers and begin pressing them. Then try one or all of these pressed flower ideas with your own creative touch. Hello Patti, I love pressing flowers!!! I have a press I brought back from England but it’s still in storage. I did, however, press a few pansies and a big Queen Anne’s lace head earlier this summer. They dried beautifully and I need to figure out something to do with them. 🙂 Good ideas here!!! Thanks Rosemary. I loved making paper too. No one writes letters anymore but It’s great for wrapping a small package. These are all such pretty ideas. I’m going to share them in my group! Thanks Mary. I’m so glad you like them. Patty! So beautiful the press flowers my alley! Thanks Maria. I knew you would love this one as a fellow nature lover. So neat to see them all together as they make such a great showcase. I posted on my DIY Gift board on Pinterest. Can’t even pick a favorite because they’re all awesome! One of my reasons for doing a roundup is to help people see some posts they have may have missed Also saving the post to Pinterest help by getting it out to the public so thank you Carole. All of these ideas are so pretty! Thanks for the inspiration, Patti! So glad you liked them Jennifer. I’m so glad you like the project Julie and thanks for the feature! I want to do every single one of these projects! If I gather up supplies, can I come to your house and get a personal lesson? Gwin, you are too funny. I’m glad you like the projects. I would love to have you come over for a fun craft day but you can easily do any of them on your own. I can’t tell you how much I LOVE this post! And I can’t wait to try this! Thanks For sharing!!! Thanks, Kristi. I’m so glad you like it.